The Level 4 Certificate in Education and Training was previously known as the Level 3 / Level 4 CTLLS or Certificate in Teaching in the Lifelong Learning Sector. On the new framework, this is now only available as a Level 4 qualification. The ELN Level 4 Certificate in Education & Training is accredited by NOCN and Edexcel Pearson. By doing this course you will become a trainer in your specialist area and will be qualified to teach up to Level 4 courses. 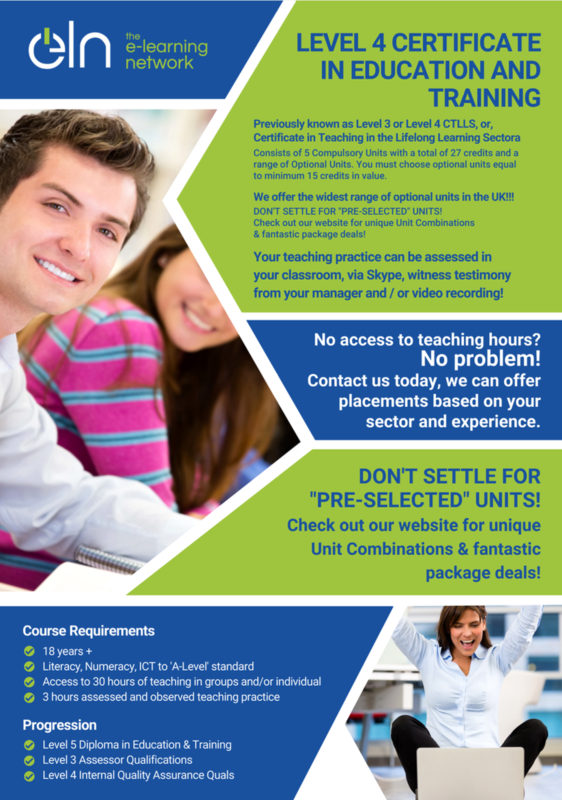 Check out all the optional units available below to customise your course and make sure you get in touch with us to find out more about our package discounts - we can combine this Level 4 CET with the Assessor and IQA courses. Click on the webchat now or email us on info@eln.io straight away. This course can be done by beginners as well as experienced trainers - you just need access to 30 hours of teaching. How does ELN conduct the assessed teaching practice sessions? At ELN The Elearning Network, we conduct assessed teaching practice sessions via Skype or video recordings or they can be assessed by a suitably qualified assessor at your own workplace. Our tutor will conduct a detailed personalised 1:1 initial interview with you before you begin your online Level 4 Certificate in Education and go through all the requirements. Completely online and self-paced - complete in a few weeks or take up to a year. Your personal tutor will be there to support you throughout the course. WE ARE CURRENTLY THE ONLY ONLINE TRAINING PROVIDER OFFERING ALL OFQUAL APPROVED 28 OPTIONAL UNITS!!! Don't settle for pre-selected units with other training providers which may not be relevant to your goals and needs. Book today and see what a difference it can be to work with a highly qualified, friendly support team who truly care about your education and training! Just click on "Apply Now" below or chat, call or email us for more info. Tony is one of ELN's most popular tutors for AET, CET and sometimes the Assessor courses too. He has been involved in training since the mid 1990’s and has experience in both the private and public sector. He has taught a variety of subjects including Engineering, Explosives, Advanced Driving & Riding and Professional Development. During his time in industry Tony worked with a number of universities where he sat on a number of boards advising on course development, gave lectures and sponsored projects (many of which turned into commercial enterprises). When Tony is not in the classroom (or online!) he enjoys the outdoor life and is happiest when riding his Ducati. Mark is ELN’s Training Manager as well as being one of our most highly rated tutors. He supports students on our DET, IQA, EQA and some Assessor courses. He has amassed over 23 years of training experience, working with all organisational levels, creating, promoting and delivering training solutions in both the public and private sectors, working throughout the UK, Middle East and Africa. He holds numerous qualifications in learning and development including the Diploma in Education and Training, Certificate in Assessing Vocational Achievement, Certificate in Leading Internal Quality Assurance and the Award in External Quality Assurance. Access to 30 hours to teaching (paid or voluntary) of which 3 hours must be assessed. We can assess via Skype / video recording, or authorise a suitably qualified person in your company to observe you on our behalf. Overlaps with the Level 3 Award in Education and Training or the older PTLLS course. Exemptions available. This unit overlaps with the Level 3 Award in Education and Training and the old Level 3 or Level 4 PTLLS course. Exemptions available. Your tutor can discuss this with you during your initial assessment. Wherever possible we will work with you to fulfill the assessment criteria using your existing work evidence if possible, reducing repetition of work produced, resulting in more efficient holistic assessments. Assessment for the Optional Units will depend on the unit you choose, previous qualifications and experience.